This compact, cost-effective remote access point is software configurable to operate in either 1x1 dual radio mode, or 2x2 single radio mode. 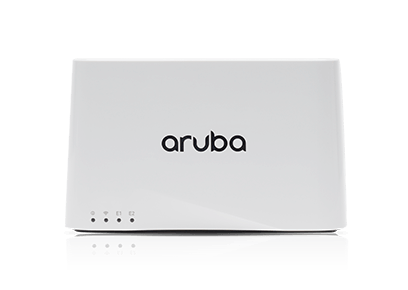 Managed by the Aruba Mobility Controller, the 203R supports centralized configuration, data encryption, policy enforcement and network services. It extends corporate resources to remote locations by establishing site-to-site VPN tunnels to the data center. It offers a variety of enterprise-class features which gives remote workers the same high-quality Wi-Fi experience they get at corporate headquarters. The RAP-203R can be deployed as a wall-mounted hospitality AP or converted to a desk mounted remote AP. Unified flexible radio 802.11ac remote AP with internal antennas. Two integrated dual-band omni-directional antennas for 2x2 MIMO with maximum individual antenna gain of 0.7dBi in 2.4GHz and 1.0dBi in 5GHz. Built-in antennas are optimized for vertical orientation of the AP. Combining the patterns of each of the antennas of the MIMO radios, the peak gain of the effective per-antenna pattern is -0.4dBi in 2.4GHz and 0.5dBi in 5GHz. The AP supports direct AC power: 90V – 265V, 47Hz – 63Hz. Note that the unit does not include an AC power cord (IEC C7 plug). A compatible region-specific cord should be selected and added when ordering the AP. Maximum (worst-case) power consumption: 7.5W. Maximum (worst-case) power consumption in idle mode: 4.6W. The AP supports desk mount without additional accessories. A cover ships with the AP to hide connectors, cables and product labels. The cover can be used to support wall mounted deployments as well.